We had a very good attendance for our February meet with lots of visitors from other chapters and a very welcome new member. We were also pleased to welcome Graham Whitty as our demonstrator for the afternoon and Graham in a very down to earth way announced he was going back to basics by showing us how to turn a thin walled bowl and a goblet also thin walled, with a captive ring. Both of these pieces from a cheery tree he said he cut down from his mother’s garden, (copying Abe Lincoln, or was it George Washington?) anyway his mother now knows who cut down the cherry tree. 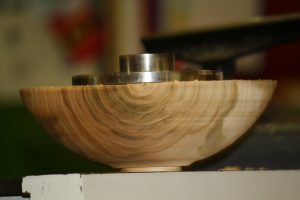 With the bowl blank which was around 220mm x 75mm mounted on a face plate and using a 10mm bowl gouge which he said he favours Graham began to shape the outside of the bowl, first cutting a spigot to fit a chuck then a foot about 6mm deep, explaining as he worked how he likes a bowl to stand up slightly the better to see the shape. 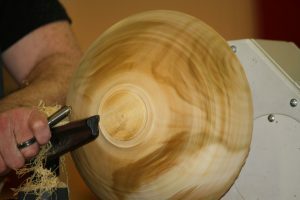 Working upwards from the foot and throwing out a fine stream of shaving Graham formed a nice curve, checking as he went for any bumps in the line, then using a scraping chisel tilted at an angle between 30 and 40 degrees brought it to a smooth finish. 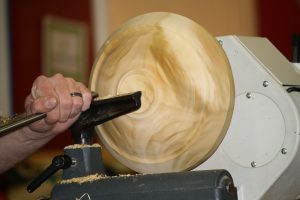 Graham now removed the faceplate and reversed the bowl on the lathe using a chuck, when satisfied with the line, began to hollow out the bowl. 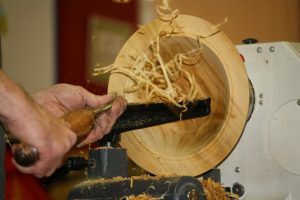 The wood was fresh and the gouge was sharp so again we had a fine stream of shaving coming off, just reaching the shoes of the guys in the front row. 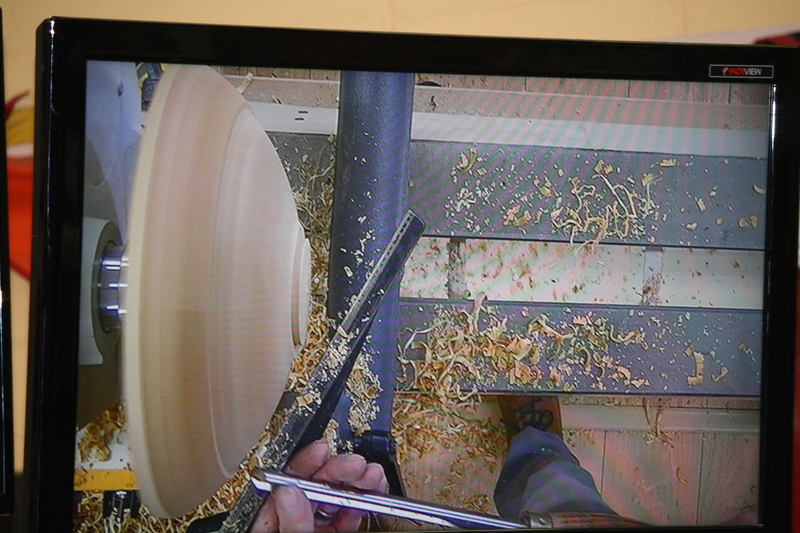 With a sweeping cut inwards Graham worked quickly to shape the inside, this time checking the wall thickness as he went taking it down to a few millimetres then with a final check using an opticians torch which showed through the wall he finished the inside with a round cabinet scraper. After our break for tea/coffee Graham got down to business again this time with a branch log from the same tree to turn the promised thin walled goblet. 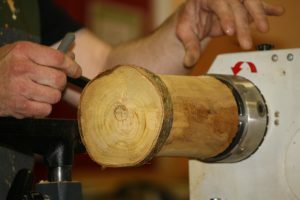 First forming a spigot on one end then mounting it in the chuck Graham explained he was going to approach this piece by shaping the inside first then follow this shape on the outside. As he was working into end grain he suggested starting from the centre and cutting outwards so as to cut with the fibres of the grain enabling a better finish. 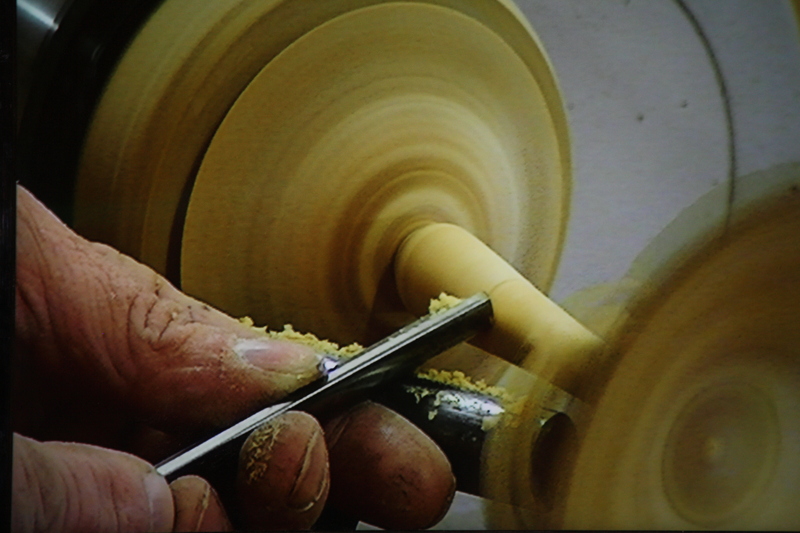 When he had the inside shaped to his liking he worked on the outside again taking the wall thickness down to a few millimetres testing it with his torch. This done, he went to work on the stem and foot reducing the stem section until he was ready to cut a captive ring and this he did with a small spindle gouge which he told us had broken so he recycled it by grinding it on the bottom, giving him a tool, which would cut beads or in this case a captive ring. 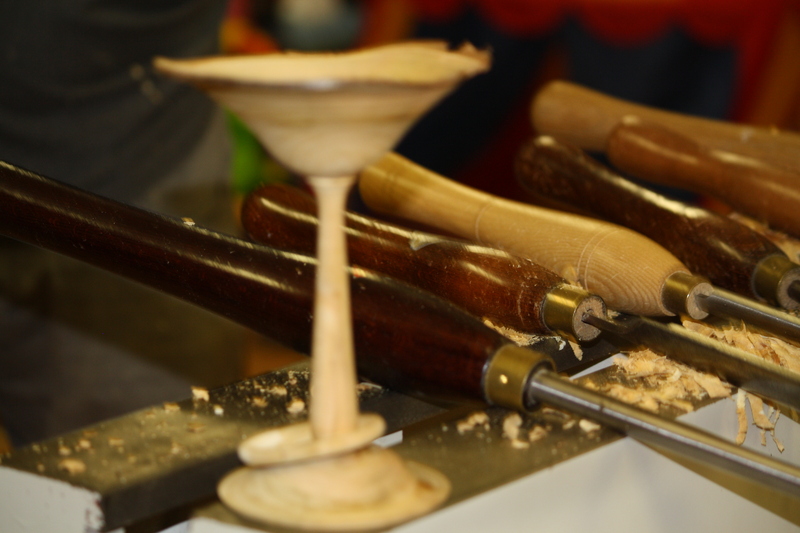 Altogether a very good and enlightening demonstration of skill and a lesson on what can be achieved on the lathe. 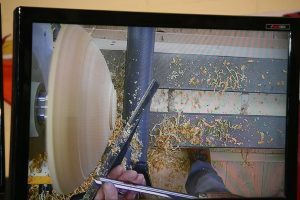 Thank you very much Graham, you certainly held my attention and I held my breath as you made the last sweeps on those so thin walls. 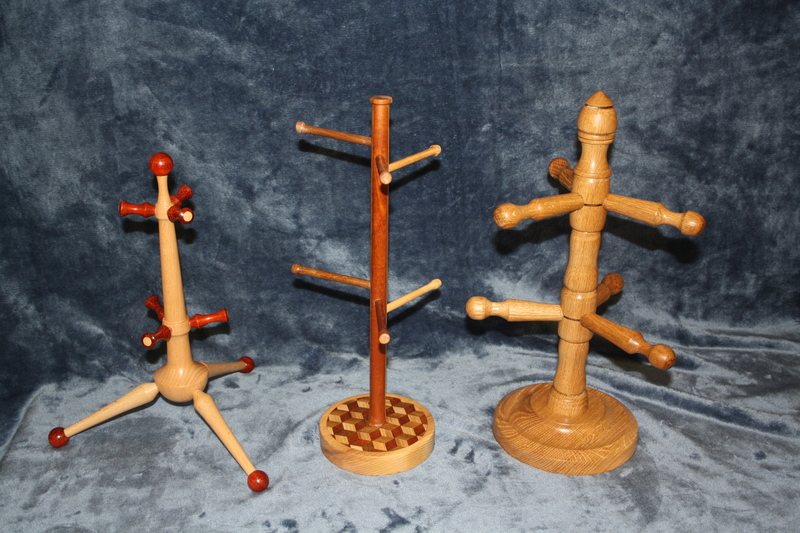 The competition results for this month were as follows. 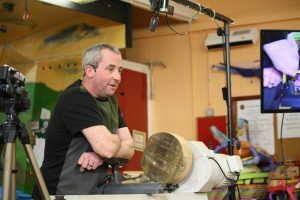 In the novice section, 1st Jim Casin 2nd Shay Clarke. In the senior section 1st Jim Hynes 2nd Pat Gannon 3rd Tom Gibson. That it for now, look forward to next month when the competition item will be, a spinning top, I’m sure you all can manage that so let’s see lots of entries so I can write in different names of winners, until then work safe.